The foundation of our product line is a host of natural ingredients. Jojoba oil, meadow foam oil, sweet almond oil, Shea butter, Shea oils, cocoa butter, mango butter, vitamin E, sea salt, jojoba wax beads, aloe vera and essential oils just to name a few. What makes Nyraju Skin Care different? At Nyraju Skin Care, we take a natural and holistic approach to caring for African American skin and hair. Your beauty begins from within and the topical products recommended are like adding icing to the cake. Using natural skin and hair care products and eating any and everything is like wearing perfume on and unwashed body. The combination is not going to give you the best results. How Do I Deal With Uneven Skin Tone and Dark Spots? 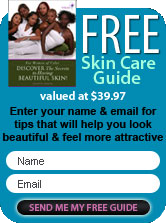 A good skin care regimen that includes exfoliation is a great way to start. Cleansing, toning and moisturizing gets your skin ready for an exfoliation treatment. Uneven skin tone is often the result of dead skin cell build up. Exfoliation helps in removing dead skin cells. As this process is done over a series of weeks, months � the sloughing away of the dead cells allows your skin to show off its beautiful glow. Dark spots are the result of trauma to your skin. Popping pimples, squeezing blackheads and pulling hairs with tweezers. Your melanin (the source that gives you your color/pigment) responds and reacts to any break or trauma to your skin. I have dark circles under my eyes, how can I Not look like a raccoon? This is a tricky question to answer. Dark circles can be the result of a few things. Take a look at your family tree, if you see this as a constant occurrence in your family, you're likely to experience this trait. Other causes are often the result of lack of sleep, dryness from lack of moisture to your skin in this area, poor eating habits and in some cases kidney dysfunction. My elbows and knees are getting darker, what can I do about this? Your elbows and knees are like any other part of your body, they need special attention. Exfoliation for these body parts is just as important as for your face, your back or the rest of your body. What you're seeing is the build up of dead skin cells on your elbows and knees. You're also seeing what happens to melanin when there's constant rubbing of your skin on a given surface. By using body scrubs or loofahs you can give your elbows and knees an exfoliation treatment that will help remove the dead skin cells. Why am I challenged with acne as an adult? Acne typically occurs when there's an overproduction of oil in your skin. One of the biggest complaints is that your face is forever shinning. But with all the oil it becomes a catch all for dirt and debris being trapped in the inner layers of your skin. This is a breeding ground for bacteria with skin eruptions waiting to take there place under your skin. One thing that's not often discussed is that acne can be triggered by the foods you eat. Acne can also be triggered by stress. My hair is thinning in my temples, how can I stop the process of thinning hair? What's your stress level? One of the top reasons for thinning temples and hair loss in general. Are you wearing wool skull caps in the winter? A given source of balding temples because of the friction. Is your hair relaxed or permed? Your temples and your crown take the brunt of chemical burns. (Butyrospermum parkii): Shea butter is solid and comes from the natural fat obtained from the karite tree grown in West and Central Africa. Also referred to as karite butter. Shea butter is an emollient that is extremely therapeutic, helping to heal cracked, aged, and damaged skin. Its chemical constituents help with bruising and soreness, and penetrates your skin and leaves it feeling soft and smooth. It has vitamin A and E and is highly compatible with the skin. Shea butter has a high content of unsaphonifiables and cinnamic esters, which have antimicrobial and moisturizing properties and provide protection from the UV. What is an exfoliant and why should I use it? An exfoliant is an ingredient, salt, sugar, pumice, or loofah, used to help remove dead skin from the body. The skin is the largest organ of the body and anything that is applied to the body is absorbed through the skin. When dead skin cells lay on top of the skin without being removed, this clogs pores and bacteria sets in and the skin does not breathe. Therefore, exfoliating the skin removes dead skin cells, (we typically know this as ash) and allows the skin to breathe and the process gives the skin a radiant glow. What's a great way to exfoliate your entire body? In this case the question was asked about exfoliating your entire body. A body butter scrub that's made with Shea butter, sea salt, turbinado sugar and jojoba wax beads give you a wonderful experience. This combination of ingredients will remove dead skin cells and moisturize your body at the same time. You'll love the way your skin feels after this treatment. Essential oils are plant matter extracts. In plain English, essential oils are the extraction of oils by way of steam distillation or solvent removal from flowers, leafs, barks, or roots of a plant or tree. Why choose a natural based product? It is very important that we are aware of what is in the products that we apply to our skin. What we put on our skin is ultimately absorbed into the skin on all cellular levels. This becomes part of the food taken into the body from the outer side. It is extremely important to be conscious of the foods taken in by mouth and by skin. How do I setup my Spa Oasis for relaxation? First and foremost, give yourself permission to take the time out for yourself. Make any and everyone aware that you will be unavailable for a certain period of time. This will be YOUR time. Supplies needed: your tub filled with warm water, music or not, flowers (live ones), essential oil of your choice and warm towels.